On my way back to Aurillac two weeks ago, I stopped off in Toulouse. I planned to attend the ‘Assises Nationales Etudiantes pour le Développement Durable 2017’ (ANEDD)1, an annual conference on sustainable development created in 2007 at Toulouse Business School (TBS) and organised by its students and academic team. As a Higher Education professional, 1985 TBS alumnus and 2016 postgraduate in Education for Sustainable Development, I was looking forward to this educational event which would take me back to my younger years as a business school student. Most importantly, it promised to be full of insights into the ways young people engage with sustainable development issues today. What could ‘Les Jardins d’ici’ gain from it? Sustainable development projects competing for the ANEDD 2017 Awards2 were to be presented in the morning to the audience and a panel of judges, with winners to be announced early afternoon. It would be great to see how meaningful and impactful the projects would turn out to be. Surely there would be something about local food and local communities, which ‘Les Jardins d’ici’ could learn from. Prize-giving was to be followed by a speech from a leading figure of the French environmentalists, Nicolas Hulot. I was looking forward to seeing how he would address this young audience. During our lunch break, I came across fruit trees in the nearby park. They had been planted for a particular purpose, which nourished my reflection further. However interesting the projects were, and indeed some of them were related to local food and local community development, for me the good news came from somewhere else. The good news was about the dynamics of sustainable development. What we could call the old school of sustainability, which delivers a ‘theoretical, static and remote sustainable development message’ and a ‘moralising discourse that makes it appear as a constraint’, as the ANEDD organising team described it, was blown away by the energy of a young generation of students and alumni who pledged for positivism. ‘We want something tangible. We are all affected, we can all engage’. ‘We want to take action and make sense of it on the way’, they said. They delivered a vibrant, powerful and refreshing message with great physical and emotional presence, which was also supported by methodically developed and informed ideas, purposefully designed products, services and business plans, and convincing pitches and presentations of achievements. ANEDD 2017: great vibes in the fully packed 400 seats lecture hall. Photo 6 April, Toulouse, France. Nicolas Hulot3 then added great insight. In particular, he pointed out that Nature invented the circular economy and that one of our major challenges for the future was to mimic it and turn our waste into resources, adding human wit to make it even better. It reminded me of mulching in arboriculture. Instead of burning pruned branches, we now turn the woody waste into mulch that protects and nourishes the fruit trees. We developed the technique, creating shredders to chip the wood, tested and improved ways of using the shredded materials. We also shared the knowledge, for instance in the advice page of the British Royal Horticultural (RHS) website ‘Woody waste: shredding and composting’4. Further research, experimentation and share of best practice will enable us to continue to improve. Could we for instance explore ways of breaking down the woody chipping into an even richer compost? Nicolas Hulot looking at his ‘100% recycled tee-shirt’ offered by one of the winning teams. Reflecting on this day at the ANEDD 2017 in the light of what I saw in the nearby park, I asked myself: How durable our commitments to sustainable development are? Taking action is one thing, but will our creations stand the test of time? In that park, there were around twenty recently planted espaliered fruit trees, which could live for more than a century. However, to become that old, they would require on-going care, because of their particular shape. The fact that they were in an open space rather than in a fenced orchard added to my questioning: how long will they actually last? Five of the espalier-shaped fruit trees planted in an open space in the Compans Caffarelli garden. I thought that way for two reasons. First, trees don’t move. In contrast, many of the students I saw in the morning, so energetic and proactive, will move out of Toulouse at the end of their studies. What happens when somebody, student or not, who committed himself/herself to a local sustainable development project requiring on site maintenance has to move on? Who will take care of it when (s)he leaves? Collaboration and partnerships are one answer: when someone moves on, colleagues and partners can recruit somebody else and keep the project going. Questioning the long-term future of what we create during the design stage of the project is another one. For instance, I am, as a general rule, in favour of planting standard fruit trees which require less on-going care than espaliers, especially when the site is not fully dedicated to orcharding. This is why those trees in the Compans Caffarelli public garden particularly attracted my attention. I was somewhat surprised that the project team went for this sort of shape. But there was another reason. Those trees were planted for children with serious illnesses, by a charity which ‘makes their dreams come true’. 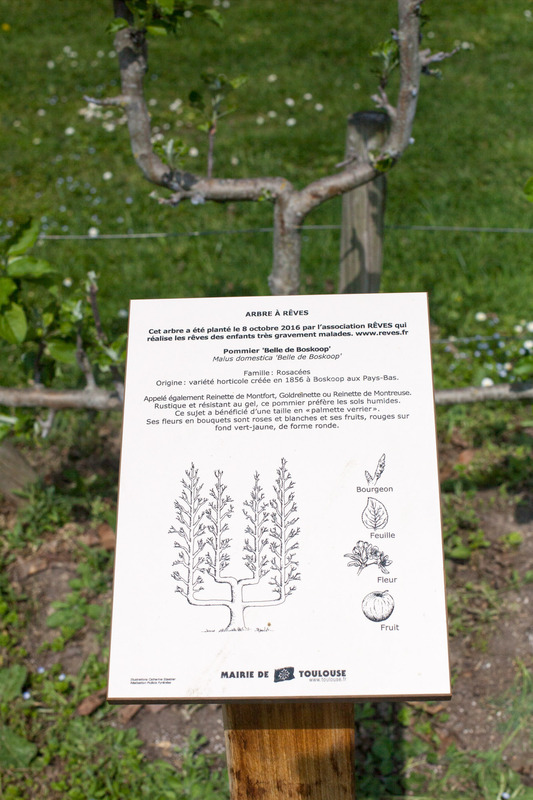 This pear tree was planted in October 2016 by the French charity ‘Rêves’5, which makes the dreams of seriously ill children come true (click on image to enlarge). I find it a great initiative. However, unfortunately, sometimes those children die. Could we ever stop taking care of such trees, which somewhat embody their soul? This example illustrates that we not only need to act in favour of sustainable development, but we also need to take into account the durability of the projects we engage in, the constraints and responsibilities we create and make plans so that there is at least a commitment of principle to their full development. Interestingly, I didn’t find any trace of this operation on the ‘Rêves’ charity website5. Accounts of children’s dreams come true displayed for reference were more about meeting a film star or visiting a famous leisure park. Maybe this message is a bit more difficult to convey, because the dream is for the tree to last? Surely, as the trees settle, the charity will mention this great achievement, which will become more and more significant by the year, as the trees grow. If well taken care of, this pear tree could become a landmark of the garden in the coming century. My reflection takes me back to the reasons why I chose to focus on fruit trees in my sustainable development research. I chose them because they nourish us without demanding too much care. I also chose them because they question us about immediacy, our tendency to go for projects with quick returns on investment. It can take seven to eight years for some varieties of apple and pear to start producing fruit. However, those ones can be among the strongest and most durable. Now I realise there are two other important elements. Trees don’t move, so they question our relationship to movement, and attachment to place. And trees can survive us, so they question our relationship to time, and attachment to life. I am imagining those espaliered fruit trees in the Compans Caffarelli garden in 2116, with a signpost mentioning ‘planted in 2016 to make a child’s dream come true’. Should that dream be made come true, or will another reality take over? The young generations, keen to embrace life to the fullest, will make sense of this, and find a way through. In their own terms. After all, the future belongs to them. Many thanks to the organizers, and participants, who made the ANEDD 2017 possible. It has been a great day for me, full of enlightenment. As for ‘Les Jardins d’ici’, this children’s dream story gave me an idea. A fruit tree is not immortal anyway. However, it can reproduce, or be cloned. Cut a scion and graft it, or plant pips from its fruit, and there will be another tree, which won’t necessarily have to be located in the Compans Caffarelli garden. Life will go on. This entry was posted in Fruit for sustainable development and tagged France, Toulouse by Les Jardins d'ici. Bookmark the permalink.